Are you getting weekly or even daily messages warning that you're about to run out of mailbox space? Mailbox Cleanup is a one-stop-clean-up tool you can use to trim the size of your mailbox. 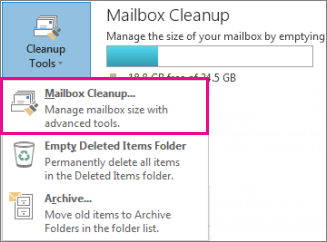 In Outlook, choose File> Cleanup Tools > Mailbox Cleanup. View the total size of your mailbox and of individual folders within it. Find items older than a certain date or size. Archive items by using AutoArchive. View the size of your Deleted Items folder and empty your Deleted Items folder. View the size of your Conflicts folder and delete this folder. Archive older items – Move old items you want to keep to an archive. You can create a separate Outlook Data File (.pst) that you can open from Outlook any time you need it. By default, Outlook automatically archives items at a regular interval. You can also archive items manually whenever you want. That way, you can decide which items to archive, when to archive them, and where to store them. Note: If you don’t see the Archive command, your organization may have turned off the feature. Empty the Deleted Items folder – Empty the Deleted Items folder frequently to make sure you aren’t keeping messages you don’t need. Empty the Junk Email folder – Periodically empty the Junk Email folder to save your inbox space for messages you actually want. Store attachments outside your mailbox – As attachments accumulate over time, they can take up a lot of space. For attachments you want to keep, consider saving them to a team site, to OneDrive, or to folders on your computer. To delete an item from both the online and offline folders, select the item, and then press DELETE. If you are using an Exchange account in Cached Exchange Mode, only the selected folder will be cleared from the local .ost file. The items on the server will be downloaded again to the .ost file on the next synchronization, if the folder is selected under Folder Options in Send/Receive Settings for the Exchange Server e-mail account. When you use Cached Exchange Mode, public folders favorites are not synchronized by default. If you choose to synchronize public folders, the size of your Offline Folder file (.ost) may increase significantly.